The Hickory Round Fire Pit Cover from Classic Accessories is made from durable Weather10 material featuring a rugged fabric outer layer with a laminated waterproof and wipe-clean inside coating. Weather Leather trim looks authentic but wont rot. Fits round fire pits up to 44-inch diameter. This Hampton Bay cover protects outdoor furniture from dust, dirt, sun, rain and heavy snow. The heavy duty Rip-Stop fabric is durable and will protect your patio furniture for years to come. With elastic and adjustable buckles on the bottom straps, these quickly secure to the furniture legs, so your cover stays on during windy days. This cover fits up to 40 -inch L x 40 -inch W x 25 -inch H.
The designed is based on contrast colours on top and bottom. the idea showed up that the Hampton Bay patio Cover is not only protective outdoor furniture from dust, dirt, sun, rain and heavy snow, but also be a decoration in garden. Heavy duty Rip-Stop fabric has durable using life time. Elastic with adjustable buckles on bottom straps secure quickly to the legs so your Cover stays on during windy days. 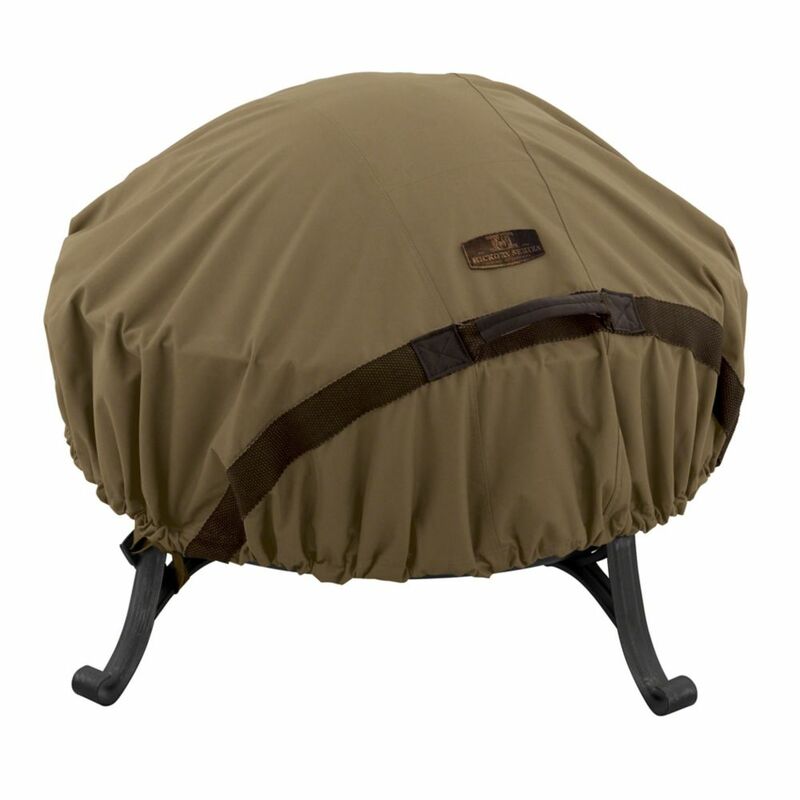 44-inch Hickory Round Fire Pit Cover The Hickory Round Fire Pit Cover from Classic Accessories is made from durable Weather10 material featuring a rugged fabric outer layer with a laminated waterproof and wipe-clean inside coating. Weather Leather trim looks authentic but wont rot. Fits round fire pits up to 44-inch diameter. 44-inch Hickory Round Fire Pit Cover is rated 4.8 out of 5 by 13. Rated 5 out of 5 by MT2 from Well made and nice looking. I was impressed with the quality, especially for the reasonable cost. Well made and nice looking. I was impressed with the quality, especially for the reasonable cost. Rated 5 out of 5 by Ralph from Excellent product. I recommend without reservation.... Excellent product. I recommend without reservation. Rated 4 out of 5 by Denise from It seems to be a good, durable cover, very well... It seems to be a good, durable cover, very well made, and fits well. Rated 4 out of 5 by tjwilsonjr from Great Cover I love the look and fit of the Hickory grill cover. The quality is far better then any cover purchased at the big box stores. The only issue and reason for not giving it five stars is because the material fades really bad it the sun. The fabric has not failed but it looses its color really fast and this makes it look older than it should. I have attached a picture of my standard cart grill cover and my new smoker cover to show the difference. This is just a little over a year. The fading takes away from the WOW factor the cover gave off when first purchased. I currently have the Cart grill Cover, Built in Grill Cover, 2 Patio Umbrella Covers, Square Fire Pit Cover, & Square Smoker Cover. Rated 5 out of 5 by DesertDweller from Heavy Duty Cover Quality material, heavy gauge. Had to buy a 44" suze to cover a 36" fire pit, because it has a large domed screen. Hopefully, it will last at least as long as the cover that came with the fire pit--4 years. Rated 4 out of 5 by MalibuMark from Excellent overall quality, BUT unlike the photo, this cover only covers the very top portion of y... Excellent overall quality, BUT unlike the photo, this cover only covers the very top portion of your 44" fire pit. The sides will be exposed to the elements.